What happened to the ranch and all those animals? Michael Jackson's Neverland Ranch in Los Olivos, outside Santa Barbara. The sprawling home is famous for being more theme park than home, with rides and exotic animals including giraffes and pythons. The ranch is also infamous for being the site of alleged misconduct with teenage boys, though Jackson was acquitted in court. 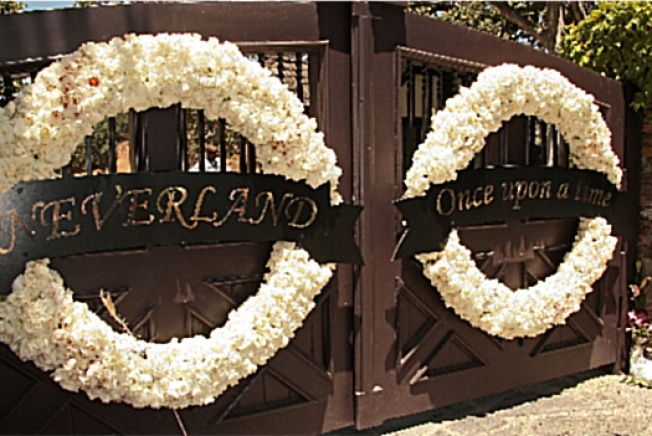 Michael Jackson is no longer king of Neverland Ranch. According to a TMZ report, the pop star's sprawling residence in Santa Barbara wine country is now owned by Sycamore Valley Ranch Company LLC. So does this mean no more paparazzi? No more petting zoo? Not so fast. Dig a little deeper and the documents show Michael Jackson is in a business partnership with Colony Capital, a division of Sycamore, which happens to own the Las Vegas Hilton. In fact Colony Capital bought Jackson's $23.5 million mortgage a few years ago. That's quite a coincidence considering rumors have swirled for years that Jackson would get his own Vegas show. What will happen to the storied property? There's a lot of room ever since MJ's beloved exotic animals were adopted by a non-profit sanctuary in Arizona. We hear the LA Zoo may need a new elephant refuge. Just a thought.